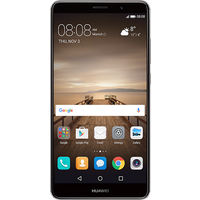 The Huawei Mate 9 comes in a full metal unibody with a fingerprint sensor on the back for security. It has a 1080x1920px 5.9" screen which delivers an impressive image from all angles. Its 1.8GHz octa-core processor is paired with 4GB of RAM for speedy performance and its 64GB capacity can be upgraded by up to 256GB. Furthermore it's dual SIM, so you can be flexible about what network to use.